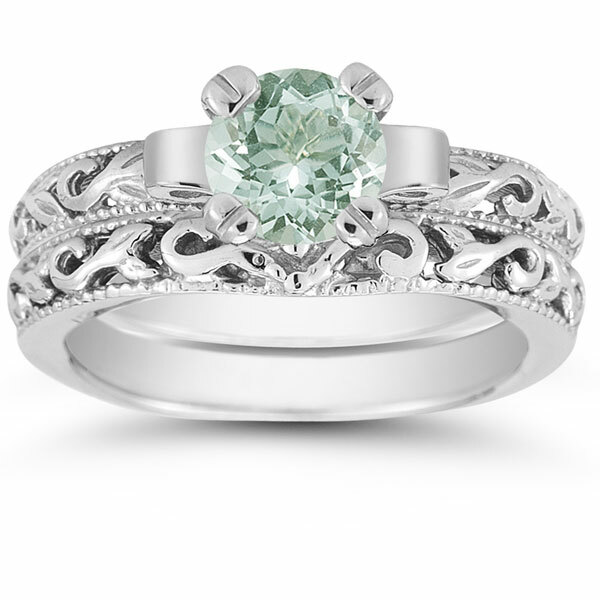 Art deco design and a touch of green hue come together to create this beautiful Apples of Gold bridal ring set. Two bands of sterling silver offer a gleaming white color that is expertly crafted to reveal art deco styling. Complete with milgrain edging, the bands offer an elegant foundation for the centerpiece of the set. 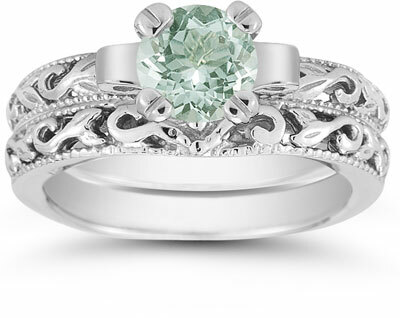 A sterling silver setting raises the 6mm green amethyst gemstone to a place of honor, and the stone offers just a hint of green color for this beautiful ring set. We guarantee our Green Amethyst 1 Carat Bridal Set in Sterling Silver to be high quality, authentic jewelry, as described above.